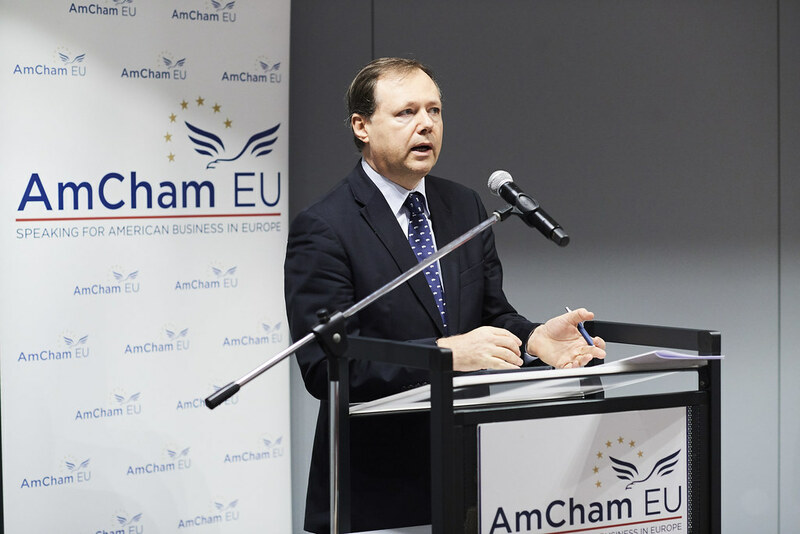 Susan Danger, CEO of AmCham EU and Maxime Bureau, Chairman of AmCham EU emphasised the increasing influence digital transformation has on all sectors and companies. Mr Bureau acknowledged the Digital Single Market as the best vehicle for digital innovation and flagged Privacy Shield as a clear example of constructive EU-US cooperation in the digital economy. Roberto Viola, Director General for DG Connect, European Commission, delivered the opening keynote address. He highlighted the crucial role transatlantic cooperation has in strengthening the Digital Single Market and catalysing the digital transformation. This transformation fosters important economic and social benefits. Digital innovation improves the lives of millions in all sectors, with safer transport, clean air solutions, the development of ground-breaking medical technology and the free flow of data, to name a few. On the role of regulation, Viola stressed that public policy needs to be solution-oriented, address existing challenges and avoid to stifle competition and digital innovation. In this spirit, the Commission will work its Artificial Intelligence initiative due for spring 2018. The first panel focused on Creating a smart policy environment for innovation, investment & competition. It was moderated by Claudia Selli (AT&T) and featuring MEP Eva Maydell, Kamila Kloc (Vice-President Ansip cabinet), Pascal Rogard (French Permanent Representation), Liam Benham (IBM), Susan Shook (P&G), Thomas Myrup-Kristensen (Facebook). It looked at how to find a balance between regulation and an environment that allows digital innovation and competition to thrive. A “new deal” is needed in between policy and industry, more engagement from policy-makers and a constructive dialogue between both sides is required before launching proposals. This was followed by a fireside chat between Johannes Gungl, Chair of BEREC 2018 and Anthony Gardner, Senior Counsel, Sidley Austin LLP and Senior Adviser, Brunswick Global. They discussed the need to increase digital transatlantic cooperation to catch up with developments in Asia. Gungl also talked about the next developments in the digital economy, the Internet of Things (IoT), implementation of 5G networks and changes to net neutrality rules. The second panel on People, internet & machines in a world of unlimited data focused on the benefits and impacts IoT. It was moderated by Claudio Murri (FleishmanEurope) and featured MEP Dita Charanzova, Pearse O’Donohue (DG Connect), Ernst Stöckl Pukall (BMWi), Eric Greffier (Cisco France), Robert Falck (Einride) and Kenny Pool (Dell EMC). IoT is already a reality and the potential is huge. However, digital innovation will not be successful if the next generation does not have the skills to facilitate the digital economy. Education is the solution, but it is not a straightforward remedy as it remains a national government competence. The event concluded with a closing address from Adam Shub, Chargé d’Affaires, US Mission to the EU. He outlined key priorities on EU digital policy, including data flows, privacy, standards and cybersecurity. You can see the photos and see the full programme from the event here.